Provide comfort for the family of Sandra Dellwo with a meaningful gesture of sympathy. Sandra Lee Dellwo, 81 , of Seeley Lake, passed away on Saturday January 19th, 2019 at her home in Seeley Lake. Sandy was born on June 4th, 1937 in Ronan, to Leonard and Helen Swanson. She commuted to Missoula by bus to attend Helgate High School. On July 7th, 1956 she married Thomas H. Dellwo in Superior. The couple lived in Seeley Lake. 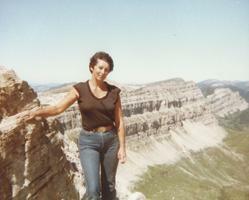 Sandy enjoyed camping, riding horses, fishing, hunting, snowmobiling, gardening, quilting and cooking. She loved the outdoors and spending time with her family, grandchildren and great grandchildren. Mom was one of the strongest women we all grew up around. Her love of her family was shown everyday by her words and actions. She would always put her family’s needs before her own. Her love spilled over from family to all of her animals too. No stray dog or cat was ever turned away. She always had treats in the closet and a pellet in her pocket for the horses. Mom’s big heart and kind smile will be missed. Happy trails Mom. Preceded in death by parents Leonard and Helen Swanson, and brother Gary Swanson. Survivors include her husband of 62 years Tom, sons Mike (Joan) Dellwo, Dean (Gerri) Dellwo, daughter Theresa (Jeff) Christiansen, four grandchildren Lane (Kati) Dellwo, Brooke (Darin) Woodside, Jesse and Tyler Christiansen (Kelsea Mackenstad), three great grandchildren Nick and Macy Dellwo and Steel Woodside. Brother Terry (Bonnie) Swanson, nieces and nephews. Family and Friends Celebration of Life to be determined at a later date. To send flowers in memory of Sandra Lee Dellwo, please visit our Heartfelt Sympathies Store.